today, during the raid, i refit my ironclads from siege bat 3 to siege bat 4 along with adding sts3, a phalanx and trident to each ship. the difference in damage shocked me! before the refit, i had been doing 3 full sets of 60s before needing 5-6 hrs repair. after the refit, it dropped to being able to only do 1 set of 60s for the same amount of damage! after finding out about this bug with siege bat 4, (thanks @Shapu_the_farm ), i have since refit my ironclads back to siege bat 3 and am once again able to do 3 full sets of 60s before needing repair. i'm changing my buccaneer design as well. thankfully i caught the problem before i had more than 1 built. 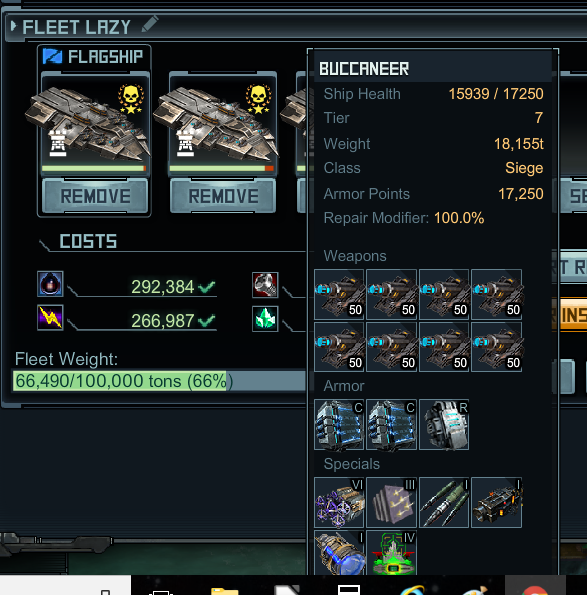 Notice that the fifth ship is my countermeasure ship. I use a Harlock's Ironclad. If you don't have one, expect to do one 60 set per repair cycle. This could be one of the reasons that the Canoneers are not working as intended in this raid. It would seem certain that there is a bug and lower levels using these specials should be compensated in some way for loss of points and increased daamage. I have no faith in Kix anymore. Even if they did compensate us it would be some piddly amount that is more of an insult than anything. Between this and the C1-C nerf I feel like my legs have been cut out from under me. I used all available tokens just to get my buccs out and 3 out of 4 were already fitted with Sb4 before this came to light. The one with MKX takes waaaay less damage than the other 3. Its the difference between hitting 80s effectively. I should not have to refit at this point because of this issue. Funny how bugs that work against us seem to last forever and ones that work for us are fixed ASAP. Really tired of this kind of stuff. They are not using retrofits so they have 40% turret defence, when retrofitted to R15 they are meant to go to 50% but remain at R0 instead... thats the issue. So it's affecting the higher end players that have retrofitted their SB. We want the Dry Dock NOW! http://www.facebook.com/groups/184955281636155/ We need YOU! The game needs YOU! I was responding for a friend who is a level 94 but who I would call a Mid Level player with low end tech. As it happens she has retroed her SB3 to R15. You know....it would just be nice to see someone official acknowledge the issue. A little communication would go a long way. But I guess that's asking too much. The difference between Siege Batt and FLCM is only .5%. The math doesn't work. At all. That's almost triple the damage. Siege bat is 40%, flcm is 50%. Yes I know seige stated 49.5% but it broken. The r15 is not apply now till Kix fix it. That's what I was thinking as well. but at this point there is probably no chance of any correction before the end of the event. It is being looked into. I wouldn't expect a fix for it before the event ends though. So everyone that is running SB should be sending in some tickets? Gotcha. Because they have known the retro wasn't being applied for a while now. Thats the short answer why Siege Battery is not protecting you as well as FLCMS. But I guess it was much more important to "fix" the C1-C armor instead. are you thinkin siege battery is out of warranty? So all that time & effort & Unobtainium retrofitting it is down the gurgler? With the current trend Kixeye has been pulling in the last year of fixing things they have broken, Do not expect a fix ever, they will tell you they are working on it, but if it generates coin for them they will not be working on it. Yes SB series is bugged. I have identical buccs built with sb4 and mx1... very noticeable difference in damage taken. Enormous difference over the course of this raid series. Lame. Again. Are you sure it's statistically significant? I have been paying attention and am less sure because there is a fair bit of single target damage that can happen. Not saying you're wrong, but pointing out some randomness can throw things off easily unless your sample size is very large. It might be as simple as 'working as intended'. The reason the OP found the bug is that the KW has a lot of health over which the turret defense is applied. I suspect that the issue is not related to a bug but due to the nature of the specials themselves. FLCM and Garrison battery add a flat 50% turret defence and can't be retroed. 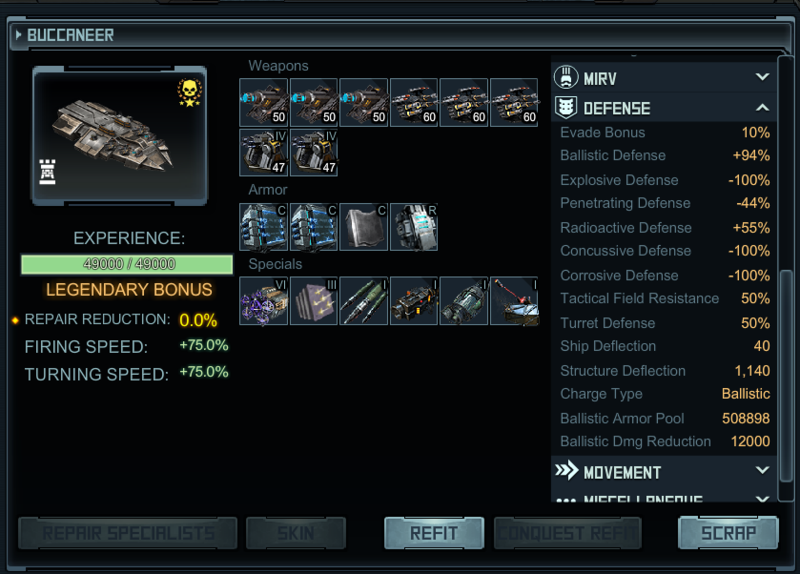 Unfortunately, all Siege battery specials can be retroed and in the retrofit research, the turret defense % is increased. As a result, the turret defense never actually reaches 50% like LFCM and Garrison battery but remains at 49.%. 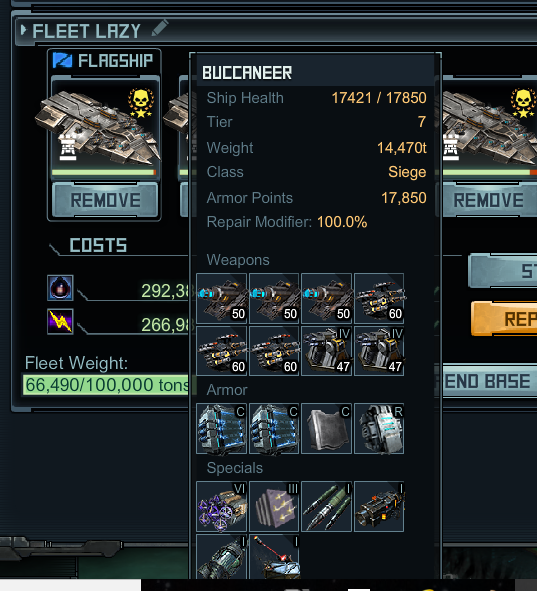 In game, specifically in the shipyard, this is rounded to 50% but Huggy's shipbuilder actually shows the real value if you hover your mouse over it, which is 49.5%. In normal cases such as PvE this isn't an issue because the ship health is rather low and therefore the discrepancy in effect between the 50% and 49.5% turret defense is negligible. However, with the high health of the KW, these values become a problem. Huggy's also shows a field with the resistances for turrets if a turret defense special is applied. As you can see in the fleet below, 50% turret defense with garrison battery acts as if the KW has double health numbers, which equals 350,000 (175,000 *2). 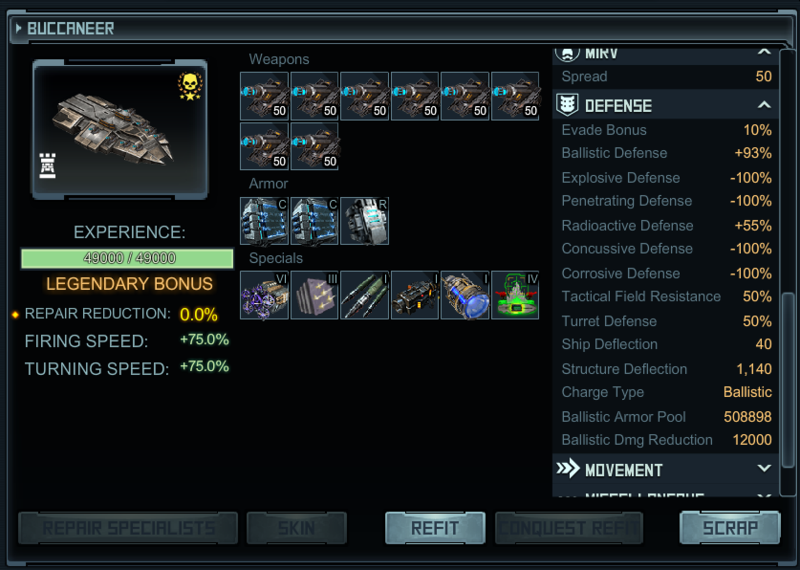 However, the second ship has Siege batter IV equipped and you can see that the values are slightly off. Instead of 350,000, the field displays 346,727 which equals exactly 49.5% turret defense. Because of the high health of the KW, this issue is starting to present a significant problem. I've also added two Levi's to demonstrate the health difference between ships with much lower armour number. Certainly would, if they only knew. I was just trying to recap the earlier parts of the thread since the person who asked hadn't read. That said, there's a lot of speculation as there often is. I wish there were a lot less hidden stats in this game, but I still like it. I know that chart was correct, since I (sorta) know the methodology he used. I was referring to your more annecdotal comment which could have easily been caused by random factors unless repeated (and tracked) an awful lot. I had hoped that kix would have fixed this issue, but it seems not to be a priority. so wait is better to hold off on putting this on anything till its fixed or is it still put on just wait for them to fix it so it works cause it seems that battery makes big difference. There shouldn't be any random factors in my test. I let my Ironclads stand in fire, stacked, then compared the damage taken. I did it a 2nd time with Res Cap instead of SB4 and Garrison and FLCM came back identical while SB3 was still lower (health). And Res Cap provided 0% help even though the Turret Defense stat shows up in the Defense block rather than the Special Ability block where it should be if it only applies when triggered.